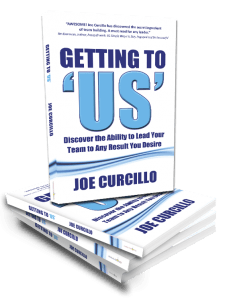 Books to Enhance Leadership, Communication, Culture and your life. Know the Superpower of a Unifying Vision! Then, you can build an unstoppable team. Do you want to communicate with purpose and passion? Then, you’d better have a freakin’point! 30 Ways to Spark the imagination of Busy People. 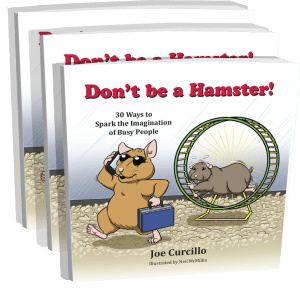 Tired of running in the hamster wheel of life? Click here to order all my books on Amazon Today! I found the advice for “maximizing the impact” of my words extremely beneficial. The way Curcillo relates his points through constant anecdotes to his two careers as a lawyer and magician kept my attention throughout. The author writes in a clear conversational style obviously drawing from many years of experience weaving a lesson on leadership out of each real life example. I can hardly wait for the next book from this author. Not only is this book a resource for motivating those around us, but it also helps us to examine flaws in our own thinking that serve as barriers to success. 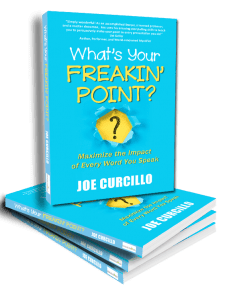 The author has a clear understanding of human motivation and provides common sense guidance on how to harness that motivation in employees to reach workplace goals. The author is engaging and entertaining from page one. He is informative and educational through his storytelling. Call Today! We look forward to working with you! Experience the ultimate in audience engagement and make exciting memories for your conference attendees!